Let me welcome you to Precision Orthopedics & Sports Medicine. I am enthusiastic about the opportunity to provide you with the most comprehensive and compassionate care possible. I’ve worked in this community since 1995, and having performed over 3,500 joint replacement surgeries, I believe this experience provides me with the necessary skills to accurately and effectively address your individual orthopedic needs. I look forward to working with you toward improving your quality of life through providing your orthopedic care. I am truly dedicated to improving the condition of active people throughout Southlake and the Midcity communities of Grapevine, Colleyville, Keller, and Arlington. If the Southlake office is more convenient for you, please tell my scheduler when making an appointment. After receiving his medical degree at Texas Tech University Health Sciences Center, Dr. Sanders completed his orthopedic surgery residency training at the University of Louisville. To further his expertise, he completed subspecialty fellowship training in hip, knee and shoulder reconstruction at the Texas Center for Joint Replacement. 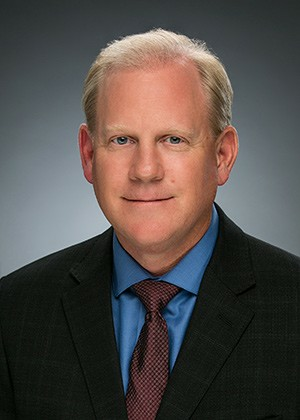 As a board certified orthopedic surgeon, Dr. Sanders not only specializes in complex and revision total joint replacement; he also has special interests in sports medicine and arthroscopy, cartilage transplantation, regenerative options, and viscosupplementation as a non-invasive treatment for injuries and arthritis in the knee. Having authored numerous articles and presentations, including publication in The Journal of Bone and Joint Surgery, Dr. Sanders is honored in Who’s Who and has been granted the Gerhard Kuntscher orthopedic award. 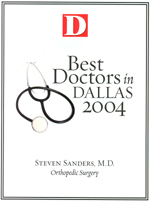 Recently, Dr. Sanders was featured in D Magazine as “Dallas’ best doctors”. In contribution to the advancement of orthopedics, he has lectured locally, nationally, and internationally. He has served the community as a member of many committees and as chairman of the Department of Orthopedic Surgery at Baylor Medical Center Irving and Board of Governors member at Irving Coppell Surgical Hospital. He is a member of professional organizations including Fellow of the American Academy of Orthopedic Surgeons, Texas Orthopedic Association, Texas Medical Association, and is certified by the American Board of Orthopedic Surgeons. During his spare time, Dr. Sanders enjoys skiing with his wife and his two daughters. He is an active member of his church and enjoys golf, hunting, and traveling. Dr. Sanders’ appearance on Good Morning Texas discussing the latest trends in total joint replacement surgery. Note: Better Faster Urgent care is for Dr Sanders Patients only.